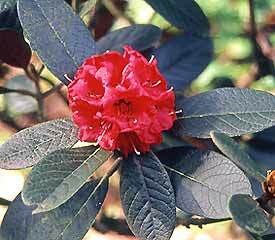 Flower/Truss Description: Tubular campanulate, crimson or scarlet. Ball-shaped truss has 7-15 flowers. Foliage Description: Leaves broadly oblanceolate to obovate, up to 6" long, dense cinnamon-brown indumentum.